What was that sound? A foot, snapping a twig in the woods? Ida knew she shouldn’t be swimming alone at night, but she’d been antsy all day. She needed to get her mind off Cressa's visit. Grace usually swam with her, but Grace had taken relatives to the Quad-City airport tonight. Besides, Ida was a strong swimmer. She knew every inch of Crescent Lake. And she thought she knew every sound. But there was that snap again. It prickled the hairs on her arms. She stopped stroking and listened, straining toward the trees on the opposite bank, just ahead. It didn't repeat. Must have been a night creature in the woods. A raccoon out foraging? This book has been a long time coming. After I had written a couple of mysteries that showed me how much I had yet to learn about writing mysteries, I put together one I considered decent. Since I’m a musician and composer (although I do a lot more arranging than composing), I wanted my sleuth to be both of those, too. Because everyone, as far as I know, composes on a keyboard, I thought it would be simpler to make her a keyboardist. (I’m a violinist.) On submission, I was told, over and over, that classical music wasn’t a good hook. However, whenever I described the project to anyone, I didn’t hear that. I heard a lot of interest. So I never gave up on this one. After my success with the Imogene Duckworthy mystery series, I dusted this one off, gave it a bit of a rewrite, and sent it to a small press where I knew the writers were happy, Barking Rain Press. I was so pleased when they accepted it! It started life as Song of Death. The publisher didn’t like that, so I got out the drawing board, better known as friends and family. One title I came up with was, I thought, very cute. Eine KleineWassermusik. It was a hybrid of the titles of a Mozart piece (Eine Kleine Nachtmusik) and Handel’s Water Music, or Wassermusik. The Mozart title means A Little Night Music. Since the bulk of the action takes place at a lake resort, my title seemed a perfect fit. Not one person liked it. I wonder why! Fellow writers brainstormed and came up with a lot of good suggestions, but the one my daughter suggested was the one the publisher liked: Eine Kleine Murder. A little bit of murder, or A small murder. Kaye George is a short story writer and novelist who has been nominated for Agatha awards twice. 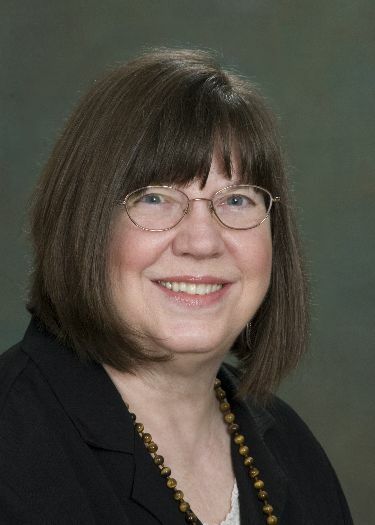 She is the author of four mystery series: the Imogene Duckworthy humorous Texas series, the Cressa Carraway musical mystery series, the FAT CAT cozy series, and The People of the Wind Neanderthal series. Her short stories can be found in her collection, A PATCHWORK OF STORIES, as well as in several anthologies, various online and print magazines. She reviews for "Suspense Magazine", writes for several newsletters and blogs, and gives workshops on short story writing and promotion. Kaye lives in Knoxville, TN. I liked the story behind the story, Kaye. Your books are on my "must-read" list. Is your MC an auditory learner? Thanks, E.B.! I hadn't thought about that. It's something I'll keep in mind going forward, because she should be, I think. WAM: Oh, my dear, Mme. 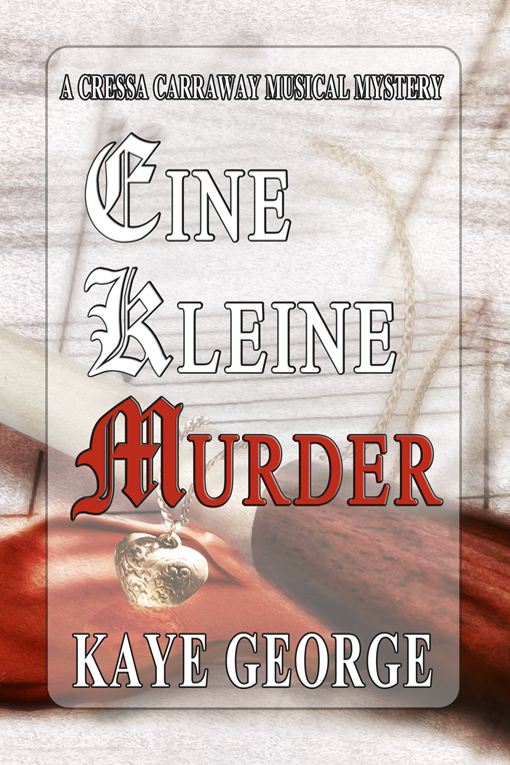 Moreno and I are so looking forward to reading Eine Kleine Murder. Although I must say, I cannot understand why Eine Kleine Wassermusik was so universally disliked - I think it's wonderful! MM: If I might just interrupt here, Amadé, as a fellow composer and mystery writer, Kaye, I love the way you've combined your passions in your writing. And the prologue really hooked me. Definitely putting this on my summer reads list! Brava! My goodness you ARE a prolific writer, and now I know you are a composer/arranger/violinist as well. VERY impressing. I think I will look for and purchase A PATCHWORK OF STORIES, because I'm in a "short" mood for the summer. But I really must check out your Cressa Carraway mysteries too. PS: Are you any relation to Elizabeth George? I played violin as a student -- but I never was too studious about it. As an adult I regret that and dream of going back one day to study. Impressive! Amadé and MM, it is a puzzlement about the rejected title, isn't it? Jackie, I'm thrilled you're looking into my short stories. They're all over the map, from light to dark. No, Kaye George is my pen name--my middle name and my husband's. My actual name, Egner, is too hard to work with! Thanks, all for stopping by. I wish so, too, Patricia! Thanks. You are one talented lady, Kaye. I'm proud to be your friend. Sheila, I've already read and enjoyed Eine Kleine Murder, so no need to enter me in the contest. I just finished the book three days ago, Kaye, and meant to email you about it. I absolutely loved it, and didn't figure out the killer until you exposed him/her - not to give anything away. I don't need entered in the contest, either, because I have my own signed copy already from Malice - a book worth buying, I might add. A very interesting post! I like the beginning of your novel--a strong narrative hook! I love the way you crowdsourced your title. 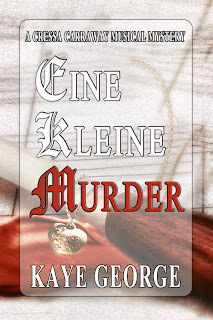 Your daughter did a wonderful job - Eine Kleine Murder is a great title. Jacqueline, your number came up for a copy of EKM! Please let me know your address (unless you want a digital copy). You can email me at kayegeorge@gmail.com. Congratulations, Jacqueline! And Kaye, thanks for being here, and for letting us know who the lucky winner is!